Dutch-American Theatricals, LLC, by special agreement with Tilted Windmills Theatricals, LLC is proud to present the New Orleans production of the critically-praised NYC fringe theatre hit, Overheard at Joe’s New Orleans. 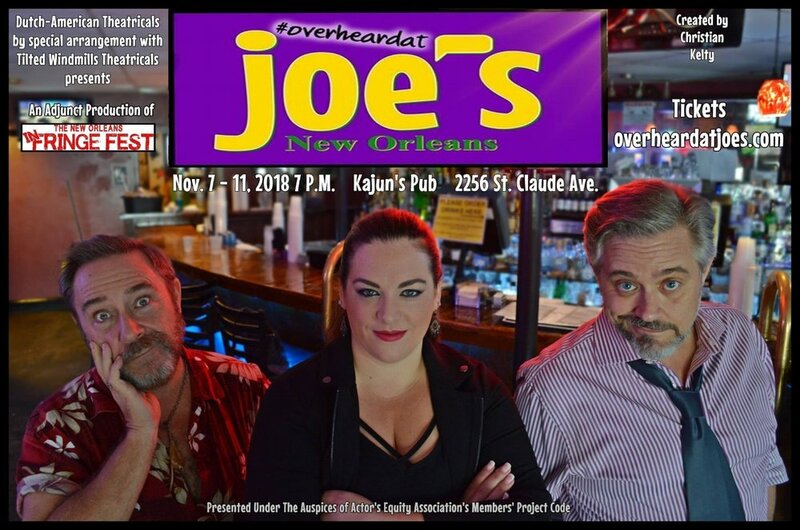 An adjunct event of the third annual InFringe Fest, Overheard at Joe’s New Orleans is a uniquely immersive environmental experience, playing for a limited run November 7th through the 11th, 2018 at Kajun’s Pub on St. Claude Avenue. It’s the 100th anniversary of Joe’s New Orleans bar, and owner Joanna has invited all the regulars to come celebrate the event. But, there’s trouble when an old friend insists Joanna sell her great-grandmother’s bar to make way for condominiums. Everyone has a say on the subject, and much more! Critics and fans of the show liken it to “walking into an episode of Cheers.” Featuring a cast of actors from New York City, New Orleans, and Orlando, a host of unique and interesting characters, live music, cake, and surprises! Kajun’s Pub, 2256 St. Claude Avenue, New Orleans, LA 70117. Starring Jessica Huckabey*, Edward R. Cox*, Vatican Lokey*, Ward Ferguson*, Soline McLain*, Vanessa Carr, Marigold Pascual, and Stephen Denning.